Please note – some knowledge of Emmet is recommended before you read this post. 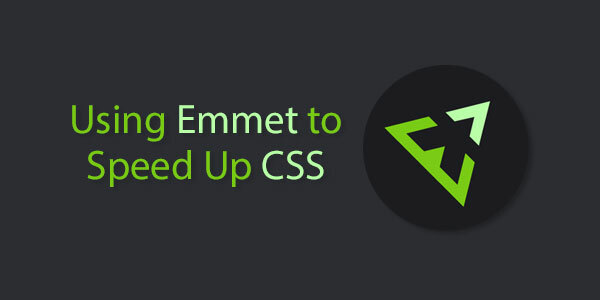 If you haven’t worked with, or heard of Emmet before, please check out this post first. Emmet is not exclusively used to code HTML, it is a powerful preprocessor which can be used to create HTML & CSS & LESS. As you will have seen in my colleague’s tutorial, Emmet can be used to expand snippets into fully formatted markup language. Obviously there’s no way to abbreviate CSS selectors since they will most likely be custom to your design. For CSS syntax, Emmet has a lot of predefined snippets for properties. For example, you can expand m abbreviation to get margin: ; snippet. By default, Emmet will use pixels as the unit of measurement, however you can override this by setting whatever units of measurement you like. So you can specify different units of measurement within one property declaration. You’re not limited to the defauly units of measurement. Definitely my favourite of all the Emmet features, Fuzzy Search allows you to type expressions that vaugely resemble CSS properties, and it will output the correct, fully formatted property. There are far too many to remember, but the Emmet Cheat Sheet is your friend here. Hopefully this should have given you some insight into how Emmet can save you a lot of time! Be sure to check out the Emmet Cheat Sheet and try it out yourself.